Team set bags are used to hold about 35 trading cards. These small poly bags are commonly used for sets of players on the same team or sometimes for subsets. 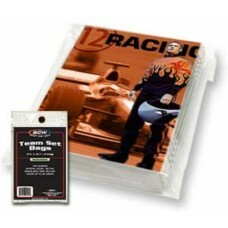 Topload holders also fit nicely inside them for added protection from dirt, dust, and scratching. Other uses include grab bags or repackaging of loose cards for giveaways or contests.